A few minutes (5 to 30 minutes during our business hours) after the payment you will receive an email from pcWorks Team with verification code to your PayPal email address to approve your payment. All orders are managed by human! Each order, placed after 09:00 PM will be executed (or the verification code will be sent) the next day at 8:30 AM! In this terms and conditions article, you will find multiple expressions and different words that bring you a wide range of meanings. One thing to note is that the plans and rates for our site can easily change, we are a reseller, and we are not affiliated with any provider. In case you have billing errors, you have to deal with the provider directly. Moreover, the charges, as well as the overall rates, are stated on our website. We charge all calls for each second, so if you are not using an entire minute, you will pay only for what you used. Connections are offering you immediate access to any designated service. Customer Literature is a combination of documents that you can find in print or online. 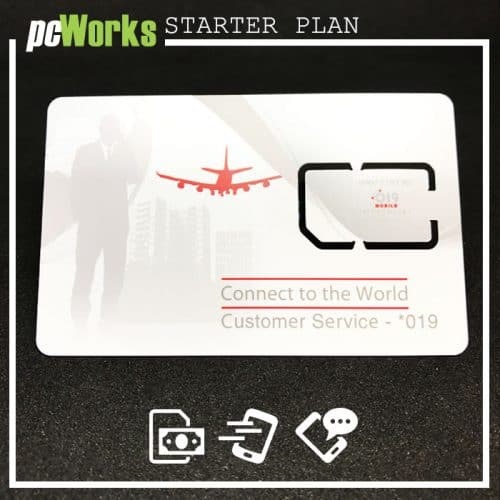 These are published by PC Works and they include all information you may need about SIM cards. This can be distributed either online or via phone, depending on the situation. Roaming allows you to use the phone’s service outside of your country. If you visit a new country, your operator will activate roaming automatically. The services referred on this page include roaming as well as other similar offerings. SIM – This is a chip card that includes your phone number. With its help, you get to access the network whenever you want. You will be able to acquire a refund if you cancel the Topup and we didn’t activate the plan. However, if the plan is already active, you can still get a refund within the first hour, but you have to notify us. You will have a cancellation fee of $5 that you have to pay if this happens. Once we receive the request to top up your balance, we will do that within the next 30 minutes. Alternatively, you can schedule this as you see fit if you want. You can select any mobile network operator, and you will receive the requested top-up fast. You have to note the fact that solely your mobile network operator will be reliable for any amount that was transferred. When this happens, you will receive a notification via email or SMS once you have a SIM top up. In case you have to cancel the top up, make sure that you contact us within the next one hour after your purchase. Keep in mind that there are no refunds permitted, since this is a direct transfer, also we don’t have any responsibility if you entered a bad number. 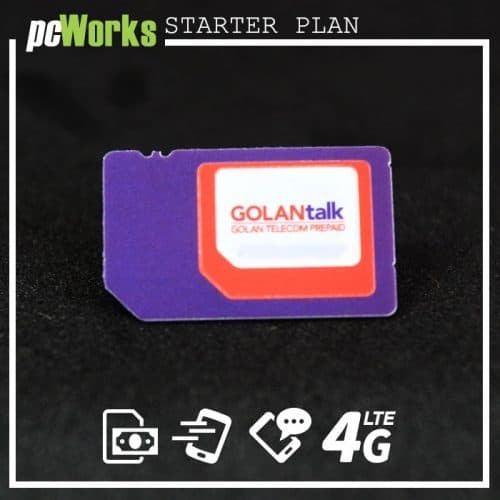 pcworks.co.il is a professional entity that is allowed to top up mobile SIMs for a multitude of mobile network operators. In order to use this service, you will have to comply with the agreement. Fraudulent or improper use of our service is prohibited, and you are liable for your actions! You will be able to acquire a refund if you cancel the Topup and you didn’t activate any plan. However, if the plan is already active, you can still get a refund within the first hour, but you have to notify us. You will have a cancellation fee of $8 that you have to pay if this happens. 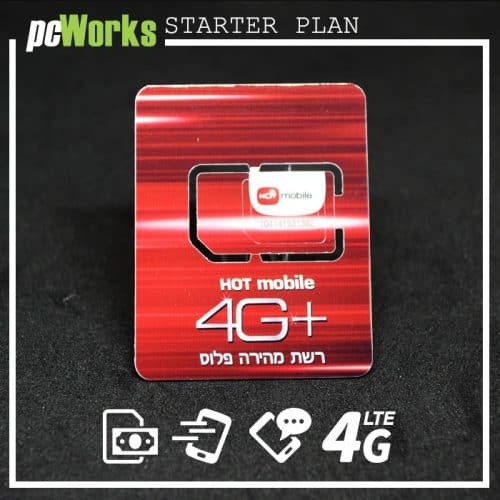 We are a third-party reseller who helps customers of all Israeli cellular companies to be able to make recharges online. The strength of the cellular company’s signal is not our competence and we can not guarantee anything. We are always focused on offering the best possible services on the market. However, there are situations where the services may have a limited availability and different quality. Things like weather conditions and radio interference may disrupt or limit our service availability. While we try to keep these things under control, there are some situations when they may not end up being as fast good as you would like. Also, the service quality will vary below the ground or inside buildings. On top of that, the services can be damaged at times, or they may not be available due to upgrades or maintenance. Things like this will appear, so you have to adapt to the situation. Plus, there are situations when the services and the network may require some changes. In this situation, the service will need to be unavailable. We will do all in our power to maintain these outages to a minimum. But they can happen, sometimes they will not be avoidable. Also, there may be times when we have to suspend the services without any notice. This can also happen in cases when you are breaching some or even one of the contract terms. Roaming will focus on the foreign network performance, and we do not have control over that. That’s why we can’t guarantee the performance of roaming services. Every rate listed here can be changed, the same thing can happen with the coverage as well. The Israeli SIM card, as well as the account and phone number, will expire if you don’t use it anywhere from 6 months to 2 years. You will need to perform calls, do any data usage or send SMSs. The balance found on your card will be valid solely for a year. In case the credit expired, you have 6 months to reclaim it. But if the balance expired, you will have to use it after you recharge your SIM! The company doesn’t offer any airtime refunds. Also, we need to be notified if you want to cancel the top up at least 24 hours beforehand. If you already activated it, then you still have 24 hours, after that, we can’t share any type of refund. In case you had any misdialed calls, we can’t offer any airtime refunds. Make sure that you work closely with the customer service if you want to make calls to another country and have difficulties. SMS messages won’t be refunded. Also, keep in mind that not every SMS can get delivered. Also, our team doesn’t refund the call support minutes either. These calls are billed at the regular rate, based on the country you are located in. A similar situation appears in the case of data usage, as there won’t be any refunds. We won’t refund any extra numbers if you already ordered them, the same goes for the discount calls or the dedicated text plans. As a SIM card owner, you are managing your calls. Also, you can register your SIM under your name. This will help you avoid any losses, in fact this way you can retain the number even if you lost your SIM! Our company doesn’t have any affiliation with mobile service providers, so we are not responsible in any way, shape or form for any damage or loss of service that results from the use of those services. In case your account is terminated, you agree that we can re-assign the PEN to another person. You also agree that our company will not be liable for any damages that arise from this. You are waiting for any potential claims, that is also valid even when pcworks.co.il was informed about potential damages. Lastly, you agree and understand that our company will not be able to reactivate any SIM card that has already expired. We can’t create SIM cards for a lost number, we can’t move your number, and we are unable to transfer the phone numbers. When you order from our business, you need to make sure that the product can be legally imported to your country. You are offered the top up terms when you want to work with PC WORKS. We recommend you to read these with complete care. This way you will avoid any potential issues that may arise. WHAT IS THIS ONLINE TOP-UP SERVICE? The great thing about the top up is that you will get it to your account balance. The transfer will happen in 30 minutes or less. Alternatively, you can schedule it to appear at a later date if you want. Regardless of the situation, you will get an SMS notification. All the orders that are placed during Saturday will be processed the next day. If you order during the holidays, we will process the order as soon as the holidays are over. The top-up service usage can be suspended depending on a multitude of situations. We can do that in those situations when we have to perform repairs or dedicated maintenance. However, if this happens, we will restore the service as fast as possible! We will also do this in case we are told by an authority to stop or suspend the service. We can stop or suspend the service in case the buyer is suspected of any fraudulent or harmful activities. Also, there are situations where the use of a top up service can be unlawful or unusual. If this situation appears, we will suspend the account. The reason is simple; we want to protect you from any unwanted charges. In case this happens, we will contact you for verification. Either way, you will get back complete control over your account as soon as the verification process is over. This top up credit can’t be exchanged, transferred or refunded. We can decline your application to top up the account. Moreover, our team is not responsible nor is it liable for any damage that can/may arise from using this service. Since you are using third party services or work with third party contractors, we are not responsible for any issues that may arise. As a mobile number owner, you can amend, start up or cancel the top up services. You will be liable for the means you use the service and dedicated features such as scheduling. Once you start using our service, you automatically agree to the terms and conditions listed here. You are the one responsible for keeping your passwords and user name safe and away from prying eyes. PC WORKS will not be responsible for any service failures if they are caused by technical problems or any potential power problems!